Pesto is one of those things you can just pick up in the supermarket, but I suggest you don't. With a very little effort you can make your own and it is so sumptuously and aromatically delicious once you make it you won't think of doing anything else. This pesto recipe is from the BBC Good Food Network. 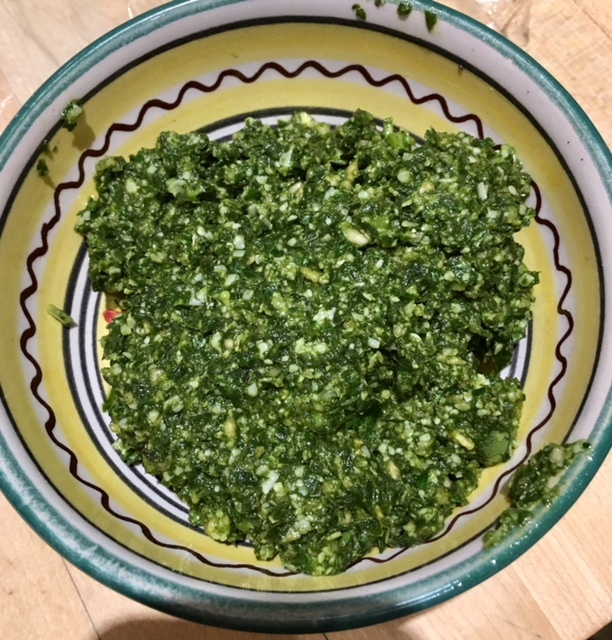 I’ve now made it, on request, several times, and it’s so much better than shop bought pesto, taking about 20 minutes, that I suggest you give it a try. 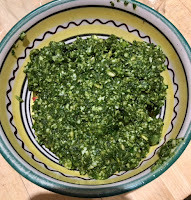 Pesto works with so many things (if you can hold back from eating it by the spoonful or scraping out the bowl), with pasta, with chicken, with courgetti (more about that in a moment). Turning simple quick meals into feasts. Last night it was Pesto with Linguini and tiny tomatoes. All you need to do to create a superb supper is cook some dried linguini, drain it then mix in your pesto in the pot adding a little extra olive oil if you want to. Top this for extra flavour with some deliciously sweet cherry tomatoes and accompany with your wine of choice - a particular favourite is Chateau Musar, a deep and intense red wine from Gaston Hochar in Lebanon which you can find here. That's it, dinner done in a flash.